The Territory and WA, unlike all other states, do not have fatigue management regulations for drivers of tour buses. 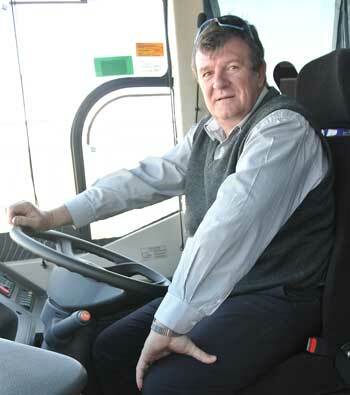 But Wayne Thompson (pictured), who chairs the transport sector of the industry body Tourism Central Australia, says NT Work Safe requires operators to provide a safe workplace for their staff. However, the interpretation of this is left to the operators and is not always clear. Mr Thompson holds an Administer Fatigue Management certification which is required in all other states and territories for managers who allocate duties to driving staff. He says while not speaking on behalf of any other companies, it is his understanding that most in operators in The Centre – especially the big ones – have a voluntary safety regime modelled on that of the other states. He says the company he manages, ATG Downunder, has 1370 seats on a fleet of 34 coaches, including the Alice Springs school buses. It has set rules in the spirit of the slogan “stop, revive, survive”. The maximum number of working hours per day is 16. These include at least one half hour break every five hours, when drivers walk around, engage in conversation or relax in some other way. At least every four days drivers are rostered off. If they are away from home they are still paid, but spend the day relaxing. On bigger trips, such as Alice to Darwin, the company has two drivers, who have the use of a sleeping compartment at the rear of the coach. If they cross the SA or Queensland border they are subject to the regimes there. In Queensland they can only work 12 hours a day unless they have completed a Basic Fatigue Management Course. Mr Thompson says the safety record of tour buses in the NT, despite the region’s massive distances, is very good. The tourist fatalities – sadly – are mostly self drivers. The lack of regulation allows some flexibility, for example, during floods when vehicles can be marooned for hours or even days. He says on several occasions his company has had to send out relief drivers to meet coaches stuck when the Palmer River was in flood across the South Stuart Highway. Steven Gelding, Executive Director NT Worksafe, says fatigue within the workplace is legislated in the Northern Territory under Section 19 of the Work Health and Safety (National Uniform Legislation) Act. “Section 19 outlines the primary duty of care obligations a business has to its workers and a voluntary Northern Territory code of practice has been developed by the industry and relevant government agencies to assist businesses with managing fatigue. “The Northern Territory and Western Australia are the two jurisdictions who have not adopted the Heavy Vehicle National Law Act 2012.